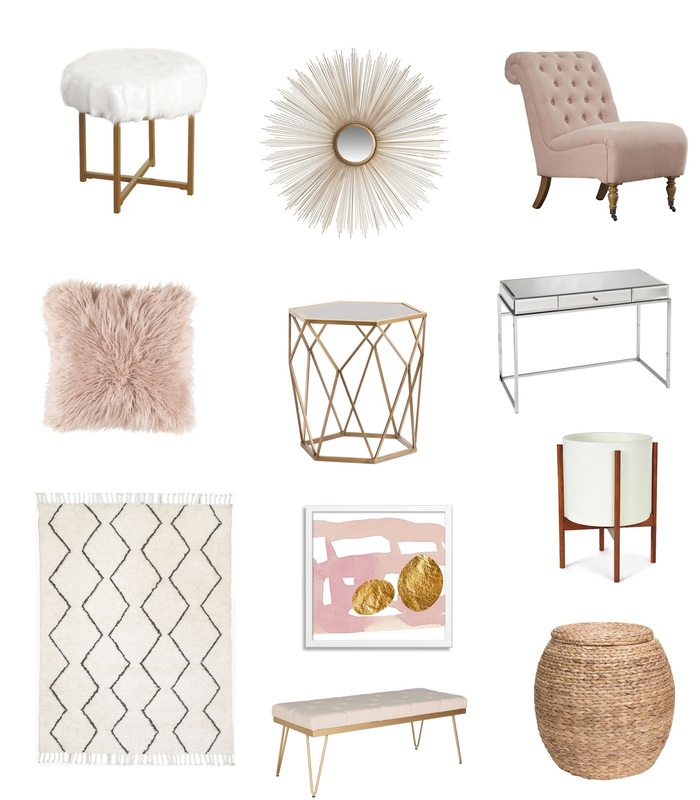 Faux Fur stool (on sale for $69) | Sun Burst mirror (only $89) | This blush chair is nearly $50% off right now, I just ordered one for my home office) | Pink mongolian lamb pillow cover | Gold accent table (On sale for $120) | Mirrored desk | This Souk wool rug never goes on sale, but it’s currently 25% off with code THISISBIG | Pink painting | Wicker storage basket | This tufted bench is currently on sale for $164, I just ordered one for our entry way! Happy Labor Day! Hope you guys are having a wonderful Holiday weekend so far! As you guys know this is one of the BIGGEST shopping Holiday’s, so today I’m sharing the best sales for all things home! It’s a great time to make those larger purchases because you can save some major cash! Like this Souk wool rug from West Elm, that’s currently 25% off! I’ve had my eye on this rug for forever, and trust me it never goes on sale! Also, I recently purchased this bench for our entry way and this tufted chair for our home office in the new apartment! I’ll be sharing pictures very soon of how the new place is coming along. Now let’s talk about all the other great sales currently taking place! I am in heaven with this post. I think we have the same interior style tastes! I’ve wanted that souk rug forever & I love gold so all those gold accents in the items you chose are perfect!